!8th-century France was a world of stinking latrines, commodes and chamber pots. Only towards the end of the Ancien Regime did water closets make an appearance. The facilities themselves have long since been swept away. Youri Carbonnier's book Maisons parisiennes des lumières (2006) surveys the remaining evidence from surveys, plans and literary sources. 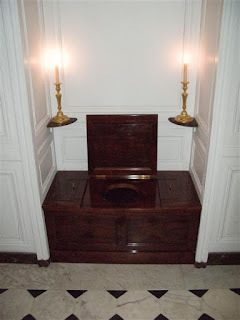 In theory at least Parisian apartment of the 18th century were equipped with two latrines, one close to the cesspit on the ground floor, either near the stairs or in an outbuilding, and a second high in the attic to minimise smell. It is not entirely clear who would use these facilities: well-to-do householders with servants would no doubt prefer a swiftly emptied chaise percé. According to Carbonnier, water closets or cabinets à l'anglaise - represented perhaps as little as 3% of all facilities. They were largely confined to the most aristocratic hôtels. In the hôtel Lambert, rue Saint-Louis en l'Ile, for instance, the apartments on the first and second floors boasted cabinets à l'anglaise, one with a marble bowl, as well as two traditional cabinets d'aisances. 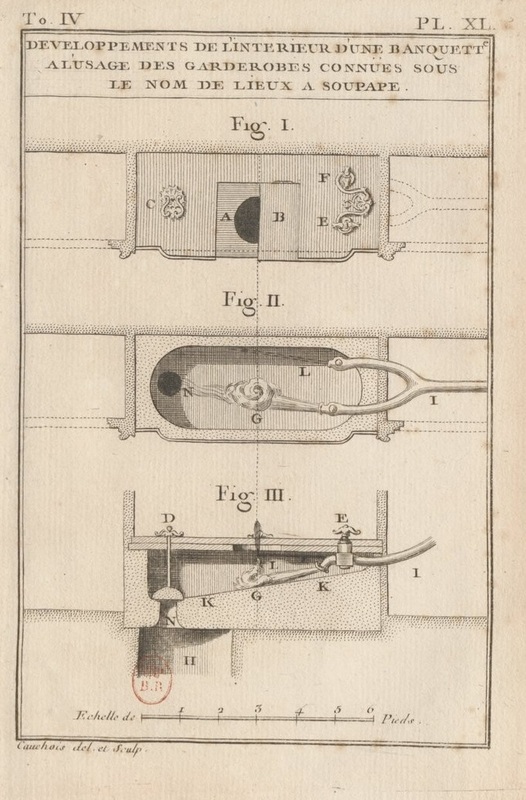 In the 1780s the hôtel de Langeac rented by Jefferson was also equipped these "lastest inventions in modern plumbing". Architectural works suggest a somewhat earlier date than might be supposed for the introduction of water closets into France. The earliest references uncovered by Youri Carbonnier occurs in the work of Jacques-François Blondel (1705-1774) whose private École des Arts, set up in Paris in 1743 was influential in the formation of many well-known neoclassical architects. 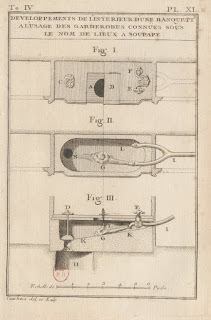 Blondel's treatise "on pleasure houses" published as early as 1737 describes a cloakroom furnished with what he calls lieux à soupape - "toilets with a valve" - which can be safely sited off a bedroom since "they never give off a bad odour". He specifies that these should be prettily decorated and fitted in a wooden surround (Blondel, De la distribution des maisons de plaisance et de la décoration des édifices en général, p.29). More detail can be found volume four of Blondel's Course of Architecture, published in 1773 by his pupil Pierre Patte on the basis lectures delivered in the 1750s. 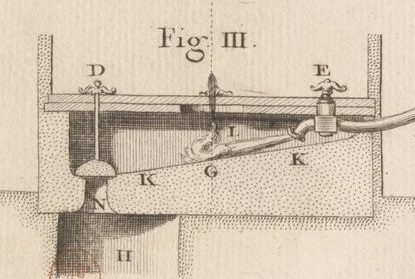 This description, complete with illustrative plate, leave no doubt that Blondel's "valve toilet" was indeed a primitive form of water closet. We are told that cloakrooms ("Garderobes") known as lieux à soupape should be provided with a circular or square niche sufficient to house a bench of fourteen or fifteen inches in height containing a hollowed out block of marble with sloping sides "to facilitate the fall of matter". A mechanism operated by a handle (C in Fig.1) operates a stop (N) which covers the outlet pipe leading down to the cesspit. This is is the "valve" which minimises rising miasmas. In addition there are further taps (E and F) which allow water into the bowl: "abundant water" washes matter down into the cesspit with sufficient force to ensure that no odour is left in the cloakroom. As a further refinement the toilet may be provided with its own separate cesspit, though even here water is necessary to ensure that no offending matter remains in the pipes. So great are the advantages that expense should not prevent their installation in buildings of consideration or even in "an ordinary house". Blondel notes that such facilities are often called lieux à l'Angloise but that this is an error, since "several persons of consideration" who have lived in London assured him that they did not know about their usage until they came to France. Blondel's patriotic denial that water closets originated in England is echoed by several other writers. The carpenter A. J. Roubo, for instance, notes that "the cloakrooms most frequently used in houses of consideration are those known as lieux à soupapes, or sometimes à l'Angloise, though with little reason, since they were known in France a long time before they came into use in England" (Roubo, L'Art du menuisier (1769-70) vol.1, p.203). "Lieux à l'Angloise are in great use today. They are very convenient and do not give off bad odours. The bowl must be of polished marble. Its usual measurement is three feet long, 16 inches wide and 15 inches high, cut with a slope...At the bottom of the slope is a hole of about three inches in diameter, and opposite are two notches for the water jets. The surround of the bowl is wooden, with a seat and a hinged lid. On the right are two handles, one of which allows a little stream of water into the bowl, the other the flush of water for cleaning. On the left is another handle which lifts a copper valve which fits tightly into the hole. When the valve is open water and matter wash into the hole, after which the valve or stop is allowed to fall and neither water nor matter remain in the bowl. A reservoir must be built to provide water to the taps via lead pipes. In bourgeois houses, porcelain bowls are used, and a lead reservoir is built at a certain height and filled with water as necessary to form a pool in the bowl. Since the bowl will be connected to the communal cesspit, care must be taken when lifting the stop, to ensure that vapours do not rise; this can be avoided by making sure that the stop is lifted only when the bowl is well filled with water. Marble and porcelain are the only suitable materials for toilet bowls, since they are odour- resistant. Neither stone nor lead should be used. This final extract comes from The Genius of Architecture by the visionary architect Nicolas Le Camus de Mézières. Describing a luxuriously appointed hôtel, Le Camus is much more interested in appropriate appearance than the intricacies of plumbing. He mentions two sorts of facilities, a garderobe de propriété and a cabinet à l'Anglaise. The first, significantly, houses a commode rather than any sort of latrine - one door gives on to the bedroom and a second onto a lobby "so that servants may attend to it without passing through the principal rooms of the apartment". Water Closet: This room closely resembles the foregoing; it serves much the same purpose, except that it is not in such general use. It is called cabinet à l'Anglaise, because it came to us from the English. The bowls are marble troughs to receive the matter, and this is soon washed away when one lifts the plug with its valve and turns the faucet, which gives water in abundance and carries away whatever is in the bowl; the plug closes hermetically, so that the odours cannot pass; it is even covered by a little water, so that no vapors may escape. There are also little conduits from which water springs when one desires to wash oneself, a custom that combines cleanliness and health. A cistern is usually placed in the mezzanine above. Delicacy suggests the attachment of a cylinder of hot coals, so that the water shall not be too cold in winter. Water is drawn from this same cistern to supply a little fountain for washing the hands, which is emptied by an overflow pipe. It is easy to give an artful arrangement to this room. The seat must never be placed facing the door, but to the right or left. It most commonly occupies a niche,square in plan, and to either side there are shelves for white napkins. At the height of the seat there is a little press in which to drop the day's soiled linen. The frames that support the little shelves for linen and scented waters normally taper to serve as a base for a vase full of perfumes and scents. This room is paved with freestone or with marble; it has a ceiling and a cornice. It is pointless to lavish ornaments upon it. The wainscoting must be simple and massive, with the look of architecture rather than of woodwork, and with panels that are either in relief or recessed in the walls; for it is generally to be painted to resemble marble, well polished, and varnished. The effect is more solid than stucco but lacks its brilliance. The same decoration may be made in plaster; but observe that the arrises are never sharp enough, which is a great disadvantage. To remedy this, you may leave your walls quite smooth and paint them to look like marble. Shadow and perspective will create whatever masses you may desire. The windows in this room will face North, so that the odors may be less in evidence; the fermentation of the matter is less promoted by cold than by heat. But, once again, this room must not offer an elegance that would be out of keeping with the rest; without a just relation between the parts and the whole, there is no architecture. Nicolas Le Camus de Mézières, The Genius of Architecture; or, The Analogy of That Art with Our Sensations, trans.David Britt, Getty Publications, 1992. When did Royalty flush?This is actually quite a difficult question to answer conclusively, but Versailles was certainly not at the vanguard of sanitary innovation. No trace of pre-Revolutionary fitments now exists; although there are several antique water closets on view these date only from the reconstructions of Louis-Philippe. According to the recent Versailles dictionary, the first lieux d'aisances à l'anglaise were installed in the palace at the time of Louis XV. One was certainly fitted for Marie-Antoinette as part of the refurbishment of the Petit Appartement de la Reine, in the early 1780s (Pierre Verlet, Le château de Versailles (1985), p.403, cited in Wikipedia). The Trianon, however, had no flushing toilets. The royal page Hézecques noted the existence in the King's private apartments of a sumptuous toilet, built à l'anglaise in marble, porcelain and acajou, which made the venerable office of porte-chaise d'affaires redundant (Souvenirs, p.212). This must have been a very new addition. 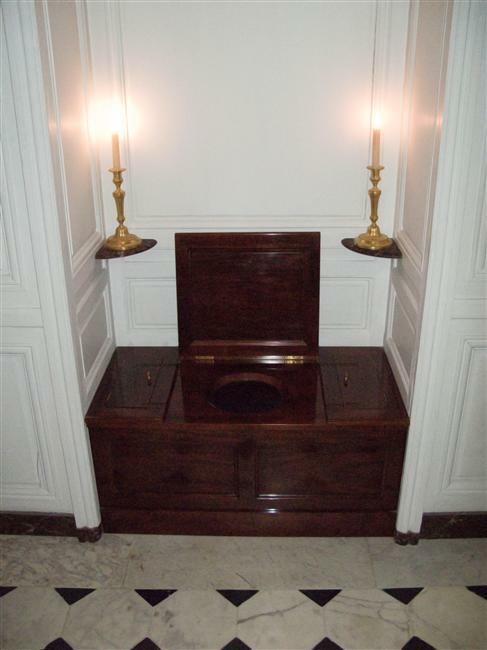 Louis XVI had wanted to install a water closet in the garde-robe off the King's bedroom as early as 1775 but it was apparently only in 1788, on the eve of Revolution, that his wish was finally fulfilled. 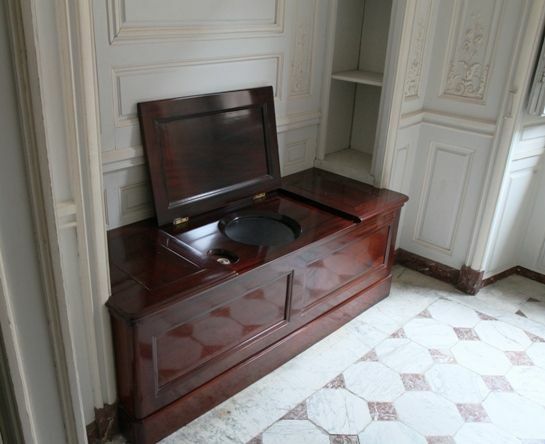 Article on the restoration of Louis's cloakroom: http://www.chateauversailles.fr/resources/pdf/fr/presse/dp_louisxvi_fr.pdf"